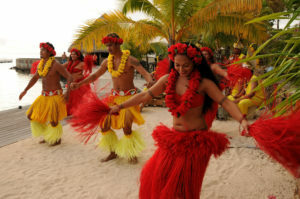 Tahiti is an amazing destination for legal weddings, symbolic weddings, vow renewals and gay weddings. - The wedding packages don't include hotels, plane tickets or primary transfers. - The prices of the wedding packages are for the couple only. - To make the reservation for the wedding and to we need 50 % of the total price of the wedding. Please note: these documents must be translated into French by an approved official translator and authenticated in conformity with the provisions applicable to the spouses’ country of origin. • Cannot be domiciled in France or any other French Territory. The bride and groom should each choose witnesses – at least one each, but no more than two – who are 18 years of age or over. Witnesses can also be provided locally. The duly completed file, including all the listed documents, must be sent to us no later than 100 days prior to the chosen wedding date. The spouses are responsible for contacting their national authorities to determine how a French marriage must be recorded under their country’s laws and regulations. As the lagoon temperature is warm all year round, it's always a good time to go to Bora Bora! But some months are likely to ensure a superior vacation because you may experience less rain, less wind; or be able to party on low season prices. Bora Bora temperatures are 26°C (80°F) and above, all year round. Lagoon water temperatures, of 26°C (80°F) and above, mean that you can swim every month of the year at the beautiful Bora Bora beaches. The climate in Tahiti and Her Islands is warm and pleasant for most of the year. Although this is the tropics, the heat is not extreme. A respite is provided by gentle South Pacific Ocean breezes and the north-easterly trade winds. There is only a small variation between daytime and nighttime temperatures, so you can look forward to balmy evenings during most of the year. Bora Bora weather is officially divided into two seasons, summer (low Season in Bora Bora) and winter (high season in Bora Bora). I like to include a third category, Bora Bora 'shoulder' season. Planning to go during the shoulder season is one of the smartest choices you can make. If you live in the northern hemisphere you may be surprised to know that summer in Bora Bora and winter in Bora Bora are at the opposite time of year to yours. Look on the map and you will see that French Polynesia is south of the equator. The Bora Bora summer months are December, January, February and March. Summer is the wet season in Tahiti. During these months there is more chance of rain and the temperatures can be slightly higher. We discovered that there are also times when the temperatures are cooler. Summer is low season for tourists in Bora Bora. Bora Bora winter months include June, July, August, September and October. 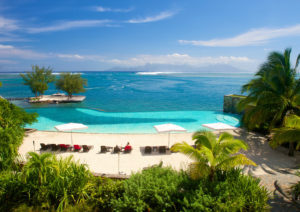 Winter is the dry season in Tahiti and usually has day after day of sunshine and blue skies. Winter is high season in Bora Bora. The middle months of April through May and November are sometimes referred to as the 'shoulder' season. Shoulder season occurs each side of winter, as the weather changes. The moderate days between seasons have some of the best Bora Bora weather.